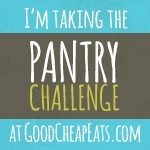 It’s time for another Pantry Challenge with Good Cheap Eats. Even though I’ve participated in the Challenge several times, I’m always excited to start anew. This is in direct contrast to how I feel at the end of the Challenge when provisions are low and I have to be more creative to come up with meals the family will actually eat (just kidding!). The two week Challenge (vs. a month-long Challenge) is much easier for me to tackle, and helps me avoid the “end of the Challenge” burnout that comes with the month-long version. Either way, the benefits far outweigh any downside: cleaning out (and using!) food I already have stored in my pantry and/or freezer, reducing waste and saving my hard earned cash. If I don’t need the money for bills, I try to stash the savings in our vacation or Christmas fund. My savings this time will come in handy with back-to-school shopping right around the corner. I plan to purchase only fresh produce and dairy items (milk, eggs, cheese, yogurt) during the Pantry Challenge. No eating out during the Pantry Challenge. Two week duration. The shorter time frame works better for me, and my family. The Boy and I will be out of town the last few days of the Challenge but I have a plan to keep the household on track (sort of). The focus this time is to make a dent in the food I have stored in my freezers and reduce the number of condiments & bottles (33 – yes 33!!!!) in my frig. I honestly have no idea how/why we have so many open jars and & bottles but it’s out of control and needs to be reduced. I usually try to do extra baking during a Challenge because it’s a great way to use up little bits and pieces. I probably won’t be doing much baking this time around because it’s HOT!! Set a budget of $100 for the 2 weeks. I’ve already spent $40 of my budget on my Bountiful Basket contribution this week, so I am left with just $60 for the remainder of the Challenge. If I stick to my budget, I will save $200. Take an inventory of my pantry & freezer(s). It’s difficult to use up my stock if I don’t know what I have, right? I have 2 refrigerator/freezers (1 in the kitchen and 1 in the garage, both top mounts). It always amazes me how much food these 2 freezers hold. And how many little bits & pieces lurk in the back. It’s time to take control & reduce the stock. Menu plan using my inventory as a reference. For me, pre-planning makes for a more successful Pantry Challenge. If you can’t plan out a week’s worth of meals, plan them out a day at a time. You will get the same result – just taking a different path. Write down my goals. If I put the goals on paper, I feel more accountable and am more likely to achieve good results. No stocking up before the Pantry Challenge – it defeats the purpose of the Challenge. I avoid this temptation by allowing myself to purchase milk, dairy and produce during the Challenge. Yesterday was our first day of the Summer Pantry Challenge- so far so good – ha! Breakfast – The Girl had eggs & toast and The Boy had cereal. Lunch – who knows? The Teens ate from the frig so it’s all good. I had a leftover Chicken Tinga Tostada. Dinner – Malibu Melt Wraps – used up pre-cooked chicken from the freezer & made homemade Honey Mustard dressing. Served with salad and grapes. So, are you ready to join the Summer 2014 Pantry Challenge? If you are, I would love to hear about your progress. Post your progress (good or bad) or any questions you have in the Comments. I’ll do my best to answer. Happy Eating!! !